An hour into the nearly 3-hour weather delay, I was beginning to ponder the ramifications of Auburn/Southern Miss/whoever calling the game off. Would Auburn get the win even though the game wasn’t half over? Would the game be cancelled and we’d have to pretend it never existed? Would people give credit or discredit Auburn on a shortened game? With all these important questions looming, and because I just like watching Auburn play football, I decided I wanted the game to game on. About halfway through the 3rd quarter, I wasn’t so sure this was the greatest idea because we weren’t watching a real football game anymore. Before the lightning and monsoon, Auburn had done alright. They were up 14-3 just before the half, had made some big stops, and the offense was starting to move. Then all of that was stopped. The teams went to their respective locker rooms and were likely told “5 more minutes” about 50 times. I wondered if some of them fell asleep. I’m sure some did. Then after what felt like 1716 hours, and a quick Homecoming ceremony, the teams came back out for a 10-minute warmup, and were expected to get back where we started. That wasn’t going to happen. It was now dark, the field was choppy and wet (despite having the best field crew in America), the student section was as full as what Alabama had at kickoff earlier in the day, and the rest of the stadium was at most 20% capacity. It was like a practice game. It was like two teams just decided to show up a play in a backyard. The problem with that is at that point Auburn and everybody else was just trying to get out of there. 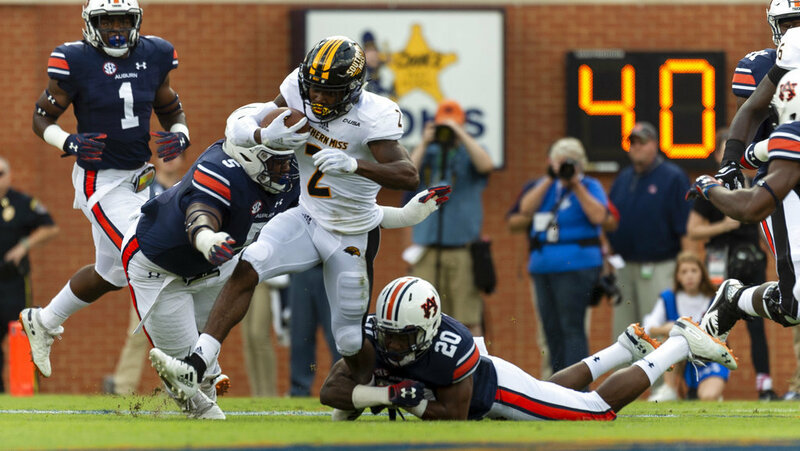 On the other side, Southern Miss saw a low score deficit, they had gotten their paycheck, and they had no reason to not run around and sling it like they are truly playing in a backyard. That said, they only mustered one touchdown in the whole post-delay game (actually the whole game), and only had one drive that seemed somewhat concerning. 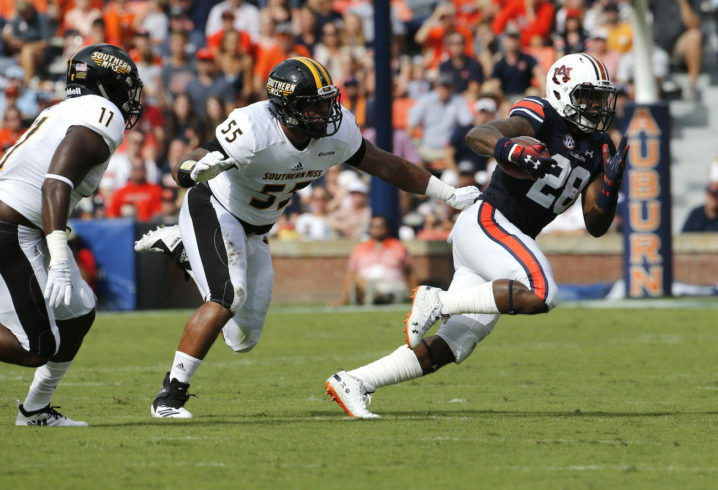 Other than that, the Auburn defense did what they’ve been doing. The offense, well they did complete two long passes, one for a touchdown, in the few occasions that Jarrett Stidham had time to throw. Other than that, the offense did what they’ve been doing. That is not creating holes to run, not giving time to throw the ball, and not really getting THAT open to have someone to throw, too. So while Auburn did gain more yards than they did the previous week, and were able to go long a few times, we still want to act like everything is over and it’s not worth playing anymore. Look, this defense is going to keep Auburn in every game. They have one of the best quarterbacks in the SEC. They have three (or four?) running backs that run hard, but just have nowhere to go. Anyway, I’m not worried about a performance in a game like this. Auburn won. They did some things better than they did last week. But now we get back to a real game. An SEC game. A game that many chalked up to a loss for much different reasons than we have now. Bring on State.